menu – What's Cookin' @ Special Collections?! Our Military & Wartime Cookery Collection (Ms2017-029) includes a wide variety of military/food related ephemera, as well as a collection of associated cataloged publications. 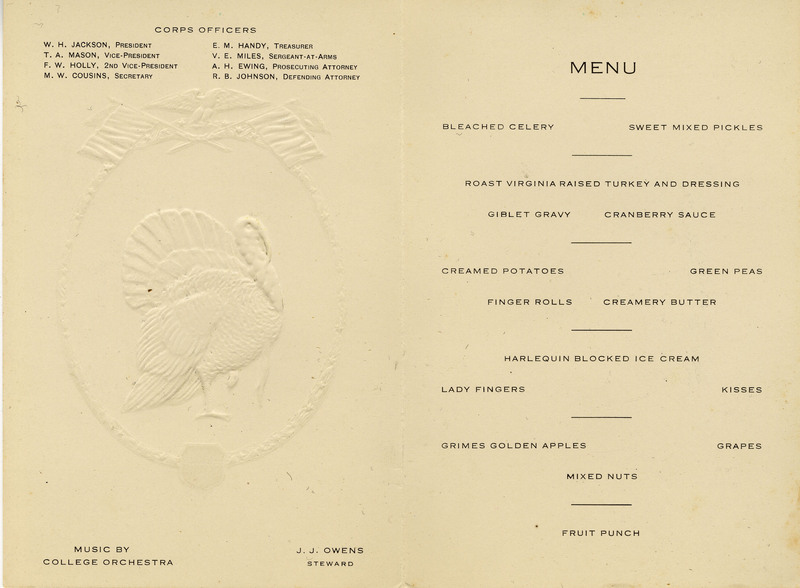 Among the materials, we found a 1935 menu from the Christmas Dinner aboard the United States Ship Nevada. The cover includes a color illustration of a decorated ship and a lighthouse, both of which are producing lights that create a Christmas Tree pattern on the water. The inside includes information about the officers, the date, and the menu itself, which tells us some interesting things about the time. It’s always interesting to see cigarettes, for example, as part of a menu. We also have a small collection of menus from American forces in Iceland during World War II. 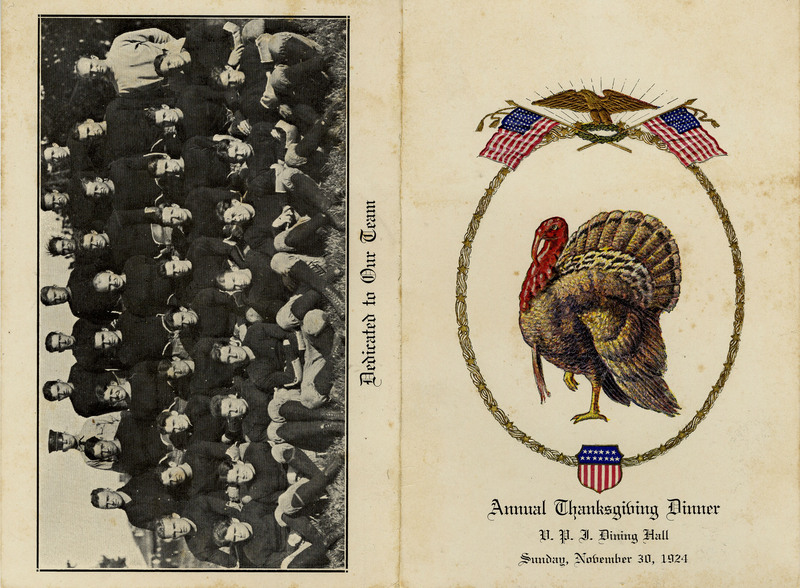 Two are for Thanksgiving and the third, below, is from Christmas 1943. The 824th Engineers Aviation Battalion was stationed in Iceland and worked to build airdromes and airfields, as well as provide improvements to the port at Reykjavik. This menu is actually eight pages long, and contains five pages with a complete list of soldiers in the battalion. In addition, it has the “signatures” page and, at the very end, the menu itself. Although they are eight years apart, the menus have a fair amount in common: fruit cake, mince pie, candy, nuts, cigarettes, rolls & butter, turkey & gravy, potatoes of one or more kinds, and cranberry sauce. And, in the 21st century, these are things we still associate with the holidays this time of year. The latter menu’s emphasis on “fresh” as a word, though, is a reminder about how special some food items would have been in Iceland in December 1943, as well as a reminder of how rare they might have been at home during rationing of the time. A number of our archivists (myself included) are attended a conference this Thursday, Friday, and Saturday (or some combination of those days). Lucky for us, it’s being held in our own backyard, just up I-81 in Roanoke. More specifically, it’s at the historic Hotel Roanoke (you can read some highlights of its history online). Special Collections includes a few resources that can give you more information on the Hotel Roanoke, from architectural plans to local history. We can also tell you a little something about dining there! We have a small collection of menus, including the below. This particular menu is the most “mysterious” of the bunch, in that it doesn’t have a date. Judging by the photograph in the menu, one might guess 1920s, but I’m still not sure of that. (The collection also has a menu from 1942 and several from the 1990s.) As you can see, it’s a wide-ranging menu for any meal–though to be honest, I kept fixating on the recurrence of “kraut juice.” Seems like an interesting item, but someone must have enjoyed it! While I don’t expect to be dining for those prices on my visit, it’s nice to know that the Hotel Roanoke is still around and continuing to build on over 130 years of tradition. We have a few other collections with menus, as well as a other menus in this particular collection, so stay tuned for future posts on dining history. You’re welcome to visit us for a menu (prix) fixe, but if you can’t, there are also some amazing digital menu collections online. Visit our Food & Drink History Resources guide and scroll down to the bottom of the page for a list. Until next week, good dining!